The first wave of three Bellingham runners arrived in Tateyama and gathered with some of the Tateyama folks and the full contingent of Port Stephens Australia runners and visitors with Tateyama Bay to their backs. There are a total of six runners from Bellingham who are competing in our Sister City Tateyama, Japan’s 35th Wakashio Marathon. Representing the Bellingham Sister Cities Association are Sabrina Romano, Sam Schell, Brad and Sandra Hubbard, and Twila and Doug Wiebe. 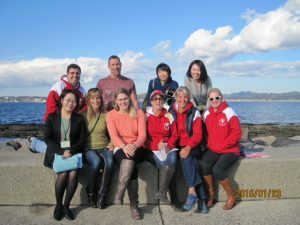 Just as this is an annual event for Bellingham Sister Cities Association to attend the Wakashio Marathon, runners from Tateyama, Japan come to Bellingham to compete in the Bellingham Bay Marathon. This event is only one of many events put on by the Bellingham Sister Cities Association through the year. If you are interested in learning more about the Bellingham Sister Cities Association (open to all Bellingham and Whatcom County residents) please visit our website. This entry was posted in Bellingham Sister Cities Association, Port Stephens Australia, Tateyama Japan and tagged Bellingham Sister Cities, BSCA, Fairhaven Runners, Japan, Port Stephens, Wakashio Marathon. Bookmark the permalink.